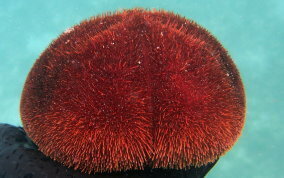 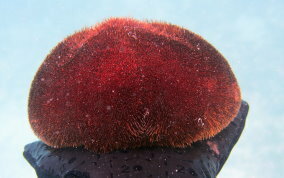 The Red heart Urchin buries itself in the sand and usualy only comes out at night. 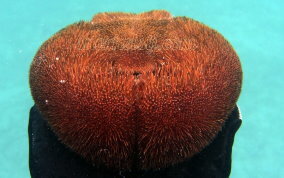 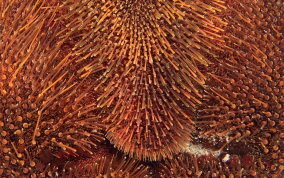 The red heart urchin is a member of the heart urchin family Spatangoida and there are two subspecies: Meoma ventricosa grandis (Gray, 1851), Meoma ventricosa ventricosa (Lamarck, 1816) There is another organism that looks VERY similar to the heart urchin that is a sea biscuit, Clypeaster rosaceus and is known as the Inflated Sea Biscuit. 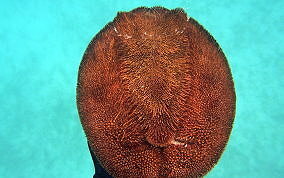 The Sea Biscuit is a member of the Sand Dollar family Clypeasteroida The two can be mistaken for each other. 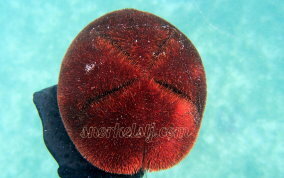 The Sea Biscuit has one center hole on the bottom and a raised pentagonal petal design on the top.